THAT ODD GIRL Why I took the GRE TWICE | Test Prep and more. Okay, I am going to start this off by being very clear- I HATED THE GRE! Like I know and get that HATE is a really strong word but my days, I HATED that exam. Cool? Okay! with that out of the way, let us begin, shall we? Hey guys! It’s that time of the year again with graduate school application deadlines just around the corner. If you are applying to the FALL/WINTER class for graduate school then this post is definitely for you and I am glad you’re taking the time to read this! I wrote my last GRE exam December 14th and most of my deadlines to get my work in was January 15th just to give you an idea of the timelines. If you want more of these types of posts don’t forget to leave me a comment and subscribe to my Newsletter! Also, if you are new here… WELCOME TO THE ODD FAM! Let’s dive in now, shall we? My first GRE exam was November 15th, 2017. It was a dark gloom day with no hope of the sun in sight… haha okay it really was a gorgeous day but yeah, I wrote my first GRE exam on Nov 15th and didn’t start truly studying for it till Oct. 27 which was not really a smart idea. For a quick context, I graduated my undergrad with a 3.85 cumulative grade point average and so I was definitely considered smart. With the sort of arrogance that my g.p.a brought me, I decided I could handle the exam without dedicating sometime to studying for it knowing fully well my kryptonite was the quantitative section. My first GRE prep consisted of skimming through the Official Guide to the GRE General test book made by the people who created the test themselves, the Educational Testing Service. Heading into the exam was very nerve-racking. I had the list of schools that I was interested in and was feeling the weight of not studying enough as I walked in. I however, said a little prayer and proceeded to write the exam. I would not say I failed but, I could have done better. My total score from my first exam was between a 290-304, too shy to say what my score actually was. This might not seem too low or too high but the average for most of the schools I was trying to get into was a 309-315 so I felt like a failure and immediately scheduled another exam for Dec 14th that night! I wish I had just taken my first score and put a lot more work in my other submissions but I was so driven by the average scores from other people, I chose to take it again. The second go-around was fairly different. I used many of the tools I have listed below to study and also dedicated 3 hrs everyday to the exam whether it was by doing practice questions or studying vocabulary flashcards. I also spent a lot more time focusing on the writing section of the exam, something I had not done on the previous exam. I loved using the online practice tests because they were easier to use than the textbooks. I also took about 6 timed practice tests which I believed helped me a little bit more. One of my really close friends drove me to my second exam and I think she helped me a lot in terms of calming my nerves. I enjoyed the ride and we listened to music a lot on the way there. This time around, I was very confident albeit still nervous about the exam and walked in there with my head held high… wanna hear something real funny? I did worse than my first exam with all my prep!!! Yep. You read that sentence right and now you’re probably wondering where the happy ending is, right? I walked out of that exam sobbing and I remember calling a friend and wondering if I was just dumber than I perceived. I remember telling everyone around me I did great because I just could not admit I did not do as well as I had hoped. I remember walking out of those exams and feeling like all hope was lost. I mean, I definitely would not get into any grad school with my score was exactly what I thought. Well, boy was I wrong. Want to know my happy ending? 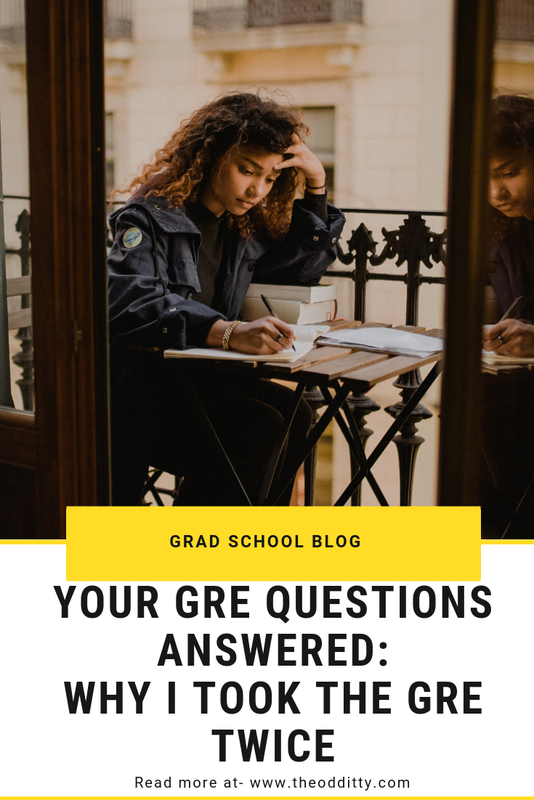 GRAD SCHOOL APPLICATIONS ARE NOT ALL GRE FOCUSED! And, that was what I had to remember. I realized I still needed to submit Letters of Recommendation, Statements of Purpose, Transcripts, Resumes etc. and these all weigh heavily in the applications and I had been so focused on the exam I had forgotten about them. One thing to note is that certain degrees place a lot of emphasis on the GRE exam and going into that you should have an idea where your degree lands but I quickly found out that my degree focused a lot on the Statements and Essays and for a couple of schools, they didn’t even require the GRE. I got into all 7 schools that I applied to ranging from George Washington University in D.C. to Texas A & M, College Station. I spent about $800-$1000 on an exam I did not end up using because the school I chose did not require the GRE and I wish I did things differently. I know this is not the usual sort of posts on the GRE but I wanted to share my personal experience with the exam and hopefully this has helped someone out there. What schools need the GRE and what schools are you applying to? Does your program weigh the GRE heavily for applications? What is the average score that the school you are applying to accepts? Once you have all that, Study hard and maintain sanity! You’ll do great! This was one of the most advertised tools to me for my second GRE go around. It helps you by giving practice questions, video tutorials to watch for the math, verbal, and writing sections. You can also read articles and get personal tutor help from the MAGOOSH team. I didn’t want to buy/spend a lot of money on prepping for the GRE so the free GRE practice tools on the ETS website were a lifesaver. I practiced using this for hours on end. They provide you with two free practice tests that simulate the actual test and include the same test-taker friendly design features you’ll encounter on test day, like moving back and forth between questions, changing answers within a section and the on-screen calculator. It definitely helped me prep for the exam seeing as the set up was very similar to the actual exam on that day. Focused on live in-person and online GRE classes to online lessons you can do at your own pace, Manhattan’s GRE prep although expensive is all-inclusive. They provide effective techniques to help you on test day, lots of available practice, personalized attention and feedback. I didn't use them specifically but I have heard glowing recommendations. HOPE YOU KILL THE EXAM! !